The King David Hotel in Jerusalem was built by the Moseri family, members of the wealthy and influential Jewish establishment in Cairo and Alexandria. They set up a shareholding company to finance its construction, consisting mainly of Egyptian businessmen and wealthy Jews from all over the world. The luxurious seven-storey building, with 200 rooms, was opened to the public in 1931. In 1938, the Mandatory government requisitioned the entire southern wing of the hotel, and housed the military command and the Mandatory government secretariat there. The British chose the King David for its central location and because it was easy to guard. They built a military communications center in the hotel basement and, for security reasons, added a side entrance linking the building to an army camp south of the hotel. Fewer than a third of the rooms were reserved for civilian use. It will be recalled that after Black Sabbath (Saturday), Menahem Begin received a letter from Moshe Sneh (chief of the Haganah General Headquarters) with instructions to blow up the King David. After preparatory work and several postponements, Irgun fighters gathered at 7 am. on Monday, July 22, 1946 at the Bet Aharon Talmud Torah seminary in Jerusalem. They arrived one by one, gave the password and assembled in one of the classrooms. They realized that they were being sent on a mission, but none of them knew what the target was. Shortly afterwards, the senior command arrived and it was only when the briefing began that the assembled fighters discovered that they were going to strike at the King David Hotel. After the weapons had been distributed, the first unit - the group of "porters" - commanded by Yosef Avni, set out. Their assignment was to reach the hotel by bus and to wait at the side entrance so as to assist in unloading the explosives from the van when it arrived. All six "porters" were disguised as Arabs so as to avoid arousing suspicion. The strike force left next in a van loaded with seven milk-churns, each containing 50 kilograms of explosives and special detonators. The commander of the operation, Yisrael Levi (Gidon), rode in the van dressed as a Sudanese waiter, while his deputy, Heinrich Reinhold (Yanai), and the other members of the unit, were dressed as Arabs. The van drove through the streets of Jerusalem, its tarpaulin cover concealing the milk-churns and the passengers, and halted at the side entrance of the hotel, through which foodstuffs were brought into the basement 'La Regence' restaurant. The fighters easily overcame the guards by the gate and hastened to the basement, where they searched all the rooms, and assembled the workers in the restaurant kitchen. They then returned to the van, brought the milk-churns into the restaurant, and placed them beside the supporting pillars . Gidon set the time fuses for 30 minutes, and ordered his men to leave. The staff gathered in the kitchen were told to leave the building 10 minutes later to avoid injury. During the withdrawal from the basement, heavy gunfire was levelled at the group and two fighters were injured. One of them, Aharon Abramovitch, later died of his wounds. I am speaking on behalf of the Hebrew underground. We have placed an explosive device in the hotel. Evacuate it at once - you have been warned. They also delivered a telephone warning to the French Consulate, adjacent to the hotel, to open their windows to prevent blast damage. The telephone messages were intended to prevent casualties. Some 25 minutes after the telephone calls, a shattering explosion shook Jerusalem, and reverberated at a great distance. 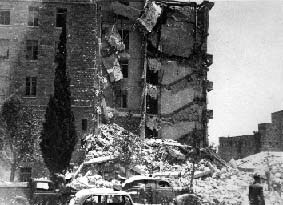 The entire southern wing of the King David Hotel - all seven storeys - was totally destroyed. For reasons unclear, the staff of the government secretariat and the military command remained in their rooms. Some of them were unaware of events, and others were not permitted to leave the building, thus accounting for the large number of victims trapped in the debris. The success of the Jewish underground in striking at the heart of British government in Palestine, and the high toll of victims, sent shock waves through England and the rest of the world. At first, the Mandatory government denied having received a telephone warning, but testimony submitted to the interrogating judge made it clear beyond a doubt that such a warning had in fact been given. Moreover, the Palestine Post telephone operator attested on oath to the police that, immediately after receiving the telephone message, she had telephoned the duty officer at the police station. The French Consulate staff opened their windows as they had been told to by the anonymous woman who telephoned them, and this was further evidence of the warning. 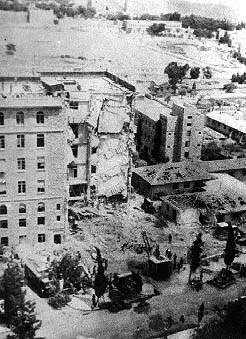 It is almost impossible to recapitulate what occurred in the government secretariat offices in the half hour preceding the explosion, but all the evidence suggests that there were numerous flaws in the security arrangements in the King David, and that a series of omissions occurred. The telephone warning was disregarded, and although the warning signal was given, an all-clear was sounded shortly before the explosion. These facts indicate that there were serious errors in the decision-making process and that internal communication did not function properly. The heads of the Jewish Agency were stunned. They feared that the British would adopt even more severe retaliatory measures than on Black Sabbath, and hastened to denounce the operation in the strongest terms. The statement they issued the following day expressed "their feelings of horror at the base and unparalleled act perpetrated today by a gang of criminals." 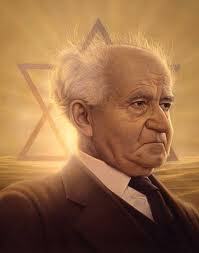 Even David Ben-Gurion, who was then in Paris, joined the chorus of condemnation, and in an interview to the French newspaper 'France Soir', declared that the Irgun was "the enemy of the Jewish people". e. The telephone warnings were given at 12:10-12:15. And if it is true, as the British liars have announced, that the explosion occurred at 12:37, they still had 22 minutes at their disposal in order to evacuate the building of its residents and workers. Therefore responsibility for loss of life among civilians rests solely with them. f. It is not true that the persons who delivered the warning spoke 'on behalf of the United Resistance' (as the press reported)... On this matter, we are refraining at present from making any further statement, but it is possible that - in the context of the savage and dastardly incitement - it will be necessary to issue such a statement at the appropriate time. [...] On July 1 - two days after the British raid on the National Institutions and on our towns and villages -we received a letter from the headquarters of the United Resistance, demanding that we carry out an attack on the center of government at the King David Hotel as soon as possible... Execution of this plan was postponed several times - both for technical reasons and at the request of the United Resistance. It was finally approved on July 22... Notwithstanding this, days later, Kol Yisrael broadcast a statement - in the name of the United Resistance - abhorring the high death toll at the King David caused by the actions of the 'dissidents'... We have kept silent for a whole year. We have faced savage incitement, such as this country has never before known. We have withstood the worst possible provocations - and remained silent. We have witnessed evasion, hypocrisy and cowardice - and remained silent. But today, when the United Resistance has expired and there is no hope that it will ever be revived... there are no longer valid reasons why we should maintain our silence concerning the assault against the center of Nazi-British rule - one of the mightiest attacks ever carried out by a militant underground. Now it is permissible to reveal the truth; now we must reveal the truth. Let the people see - and judge. July 22, 1947. "The aim of these orders are to punish the Jews in a way the race dislikes as much as any, namely by striking at their pockets"
Barker's letter reached the Irgun's intelligence service and was immediately made public in Palestine and throughout the world. The antisemitic tone of the letter greatly embarrassed the British government and diverted public opinion from the attack on the King David Hotel. Questions were asked in the House of Commons about the letter and the London Daily Herald wrote, among other things, that if General Barker had in fact written the letter, he was demonstrating his unsuitability for his position. The order was officially rescinded two weeks after it was issued, but the damage to the British cause in Palestine could not be erased. However, as a result of Black Sabbath, the moderates now held the upper hand, and at a meeting of the Jewish Agency Executive in Paris on August 5, 1946, it was decided to terminate the armed struggle against the British in Palestine. This marked the end of the glorious ten-month period when all the Jewish forces in Eretz Israel (Haganah, Irgun and Lehi) fought together against foreign rule. The terminating of the armed struggle provoked considerable resentment among many members of the Haganah, and Yitzhak Sadeh (commander of the Palmach) gave vent to this emotion in his article "Proposal and Response" in Ahdut Ha'avoda, October 15, 1946 which he signed Noded (Wanderer). There will be no capitulation, because there is nobody to order capitulation, and should such a person be found, he would find nobody to carry out the order. The Haganah focused its efforts on bringing in illegal immigrants, and in order to appease those activists in the Haganah ranks who continued to favor armed struggle, it sanctioned the sabotaging of British naval vessels which were hunting down illegal immigrants. Thus, on August 18, 1946, Palmach fighters sabotaged the Empire Haywood and two days later damaged the Empire Rival, the two ships used for deporting immigrants from Haifa to Cyprus. When the United Resistance ceased to exist, the Irgun and Lehi continued the armed struggle alone. The Irgun was now both morally and materially stronger than ever before. Support for its cause had grown, since the United Resistance had legitimized its activities. The number of recruits increased, and its stock of weapons and ammunition was expanded as a result of its acquisitions from British army depots. Free of the restrictions imposed by the Haganah command, the Irgun now intensified its anti-British activities. The Irgun had conceived a plan for the King David attack early in 1946, but the green light was given only on July first. According to Dr. Sneh, the operation was personally approved by Ben-Gurion, from his self-exile in Europe. Sadeh, the operations officer of the Haganah, and Giddy Paglin, the head of the Irgun operation under Menachem Begin agreed that thirty-five minutes advance notice would give the British time enough to evacuate the wing, without enabling them to disarm the explosion. That so many innocent civilian lives were lost in the King David massacre is a normal part of the pattern of the history of Zionist outrages: A criminal act is committed, allegedly by an isolated group, but actually under the direct authorization of the highest Zionist authorities, whether of the Jewish Agency during the Palestine Mandate or of the Government of Israel thereafter.